Eight members of the Jersey Shore Boca U18 team have confirmed their decisions to continue their soccer and academic careers in college this fall as announced today by Walt Konopka, head coach of the Boca U18 team. Players join GK teammate for plans beyond high school. Players join GK teammate in continuing soccer and academic careers. Eight members of the Jersey Shore Boca U18 team have confirmed their decisions to continue their soccer and academic careers in college this fall as announced today by Walt Konopka, head coach of the Boca U18 team and member of the Jersey Shore Boca Board of Directors. The eight Boca U18 team members include Christian Pontier of Lacey Township (Lacey HS) who will attend Stevens Institute of Technology (NJ), Jack Facemyer of Tuckerton (Pinelands Regional HS) who will attend Yale University (CT), Sean Cahill of Whiting (Manchester Township HS) who will attend Kean University (NJ), Prescott Loveland of Brick (Brick HS) who will attend Fordham University (NY), Mike Kubas of Brick (Brick HS) who will attend James Madison University (VA), Mike Baiata of Pt. Pleasant Beach (Pt. Pleasant Beach HS) who will attend William Paterson University (NJ), Will McMaster of Rumson (Christian Brothers Academy) who will attend Randolph Macon College (VA) and Patrick Bulvanoski of Ocean Township (Christian Brothers Academy) who will attend Mount St. Mary’s College (MD). “I am very proud to have had the opportunity to coach such a group of fine young men. They are all very special to me. They are all respectful young adults, good students and are very talented individuals on the soccer field. All of them have made great decisions on their choice of colleges” said Konopka. The eight Boca players join fellow Boca U18 teammate and goalkeeper Chris Konopka of Toms River (Toms River East HS) in solidifying their college decisions. Chris Konopka signed a National Letter of Intent in February to attend Providence College (RI) and play soccer for the Friars in the fall. “Some of these players were heavily recruited and will make an immediate impact on the soccer field at their respective colleges and some will have to really fight for playing time and a permanent spot on the roster. However, regardless of their level of recruiting, I’m confident that all of them will work extremely hard to succeed not only on the pitch, but in the classroom as well” Coach Konopka continued. All but one of the Jersey Shore Boca U18 players mentioned above were former members of Boca’s Super Y-League teams. Prescott Loveland joined the Boca U18s in September of 2002 and was not part of the Boca SYL program in previous years. 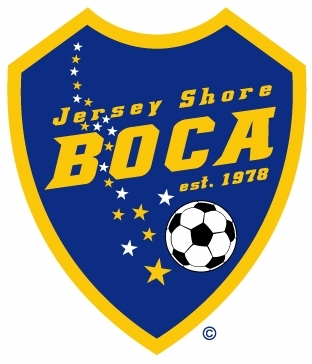 Jersey Shore Boca will again compete in the Mid-Atlantic region of the United Soccer Leagues elite Super Y-League for the third straight year in 2003. The club will field teams in four age brackets U14s, U15s, U16s and U17s. Boca is the only soccer club from Monmouth or Ocean County (NJ) that is a member of the Super Y-League. All nine Boca U18 college-bound players are currently competing for a spot on the roster of Boca’s Premier Development League team that begins its inaugural PDL season on May 4th. Jersey Shore Boca was awarded a Premier Development League franchise from the United Soccer Leagues on November 25, 2002. The Premier Development League is the only national men’s U23 amateur league in the United States. PDL rosters can have up to twenty-six players, eight of which can be over the age of 23. PDL rosters must also contain at least three players under the age of 19. The club is based out of Toms River (NJ) and in addition to their PDL and SYL teams, programs include youth level teams from U11 to U19, a U23 amateur team and men’s “open” team.